Xin’s LinkedIn page, consisting of names that commonly adorn the tallest skyscrapers in Manhattan, reflects the illustrious career of the young alumnus. In the seven years following her departure from the Hills of Westwood, she has achieved what is considerable success for most people. However, Xin is not most people. Her propitious forays into the financial world is only the beginning of her adventures. After talking to Xin for a few minutes it becomes apparent that she is constantly looking for new challenges and is willing to work exceptionally hard to bring them to fruition. It was one such adventure that led her to the United States from Singapore. After two years at a community college, she was accepted into her dream school, and began her journey at UCLA. Entering college in the shadow of the 2008 financial crisis, Xin wanted to study something that was not only interesting but also pragmatic. This coupled with her passion for problem solving made Business Economics the perfect fit. Any Junior reading this would be relieved to learn that Xin, like many of them, had no idea which path she would take. 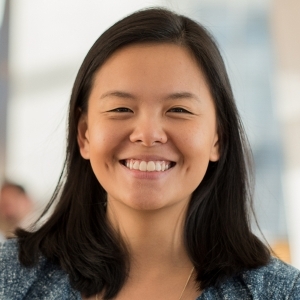 During her Junior year Xin was accepted into the prestigious Sharpe Fellows program, through which she was able to develop a strong network of peers and mentors. This network helped her secure an internship at Merrill Lynch. Later in her senior year, she got the opportunity to embark on another adventure in NYC, and she did not hesitate. When asked why she chose finance for her first job, Xin unabashedly remarked that there was no romantic Cinderella story. She was not sure of her career path and wanted a career that would enable her to grow. As a member of a generation constantly bombarded with platitudes like “follow your dreams”, it was extremely refreshing to hear someone talk about the quotidian reality. “There is nothing wrong with saying that I need the money,” believes Xin, due to the need to pay her parents back for the cost of tuition. Contrastingly, she also believes that the financial motive soon begins to erode. After the first few years, if you do not find your job interesting you will be dragging yourself to work. One needs to strike a balance. She further elaborates that the field you choose after graduation may not be the end-all. As you grow as a professional your priorities begin to shift. Conveniently, she herself was the perfect example. After seven years on Wall Street, during which she rose to position of Vice-President at Goldman Sachs, Xin’s financial needs were met. However, she felt that her growth was approaching a saturation point. She shifted her priorities to using her financial expertise to create impact on a micro-level. With this in mind, Xin recently decided to take go on a sabbatical and contemplate her next adventure. Xin posits that her success was a result of her ability to expose herself to new experiences and get comfortable with being uncomfortable. While at UCLA, Xin pushed beyond the circle of international students and actively tried to gain exposure to different backgrounds. Additionally, she was extremely self-motivated and entrepreneurial. When we asked her about the feared long working hours in finance, she said no one ever forced her to work, and that what you do in the office matters more than how many hours you spend there. She always wanted to learn as much as she could as soon as possible. This ability to go the extra-mile gave her an enhanced knowledge base which she could use to add value to whatever room she entered. Besides, she emphasized confidence and assertiveness as key qualities to succeed in her field. Throughout her education, she was taught to stand out and ask questions. She was constantly encouraged to not shy away and let her curiosity shine. These experiences shaped her ability to be comfortable in the limelight, which she believes to have contributed significantly to her promotions in the workplace. Xin’s journey represents the trials and tribulations that await so many of us as we prepare to step into the “real world”. However, it also embodies the life-lessons and triumphs that we will have the privilege to experience if we do it right. More importantly, it teaches us that whether you are an incoming Freshman, a graduating Senior, or an experienced professional on a hiatus, the adventure is just beginning.